Dendritic cells are professional antigen-presenting cells that regulate the immune system. In cancers, they uptake tumor antigens, deliver them to T cells, and induce tumor-specific T-cell responses. However, tumor cells develop mechanisms to evade the immune system, partly by impairing dendritic cell differentiation, function and longevity. 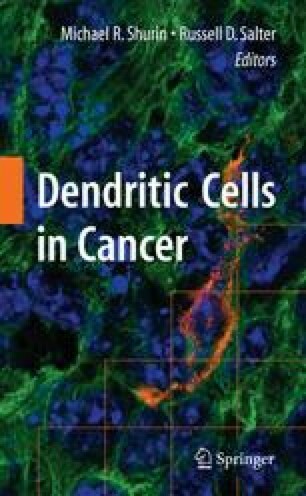 Accumulating evidence has indicated that intracellular signaling pathways, such as MAPK, JAK/STAT3, PI3K/Akt, and NF-κB, are critical to the regulation of dendritic cell differentiation, survival, and activity. However, these signaling pathways are found to be hyperactivated in both tumor cells and dendritic cells in malignancies. The constitutive activation of these pathways in cancer cells leads to tumor cell secretion of cytokines that activate intracellular signaling pathways, particularly p38 MAPK, in dendritic cells or their progenitor cells and impair dendritic cell differentiation and function. In this chapter we will discuss signaling pathways that mediate dendritic cell dysfunction. We will focus on the roles of MAPK, particularly p38 MAPK, in negatively regulating dendritic cell differentiation and function in cancers. This work was supported by institutional startup funds from the University of Texas M.D. Anderson Cancer Center, grants from the National Cancer Institute (R01 CA96569 and R01 CA103978), Multiple Myeloma Research Foundation, International Myeloma Foundation, and Commonwealth Foundation for Cancer Research. We thank Ms. Alison Woo for providing editorial assistance.